Menu items can contain widget content. Standard menu item or Widget Area item? A standard menu item (like a Post or Page) can have a widget area attached. There is also a Widget Area Advanced Menu Item. If you want a link with a widget area below it, use a standard menu item. If you want a widget area with no link/header, use the Widget Area item. Go to Appearance > Menus and click the Uber button on the menu item to open the Menu Item Settings Panel. Click the Widgets tab on the left. To create a widget area specific for this item, just enter a name in the Custom Widget Area setting. When you save your item, a Widget Area with this name will appear in your Widgets screen. Adjust the Layout of the item in the Layout tab to set the width of the widget area, if desired. Go to Appearance > Widgets and assign your desired widgets to the appropriate UberMenu Widget Areas. If you have deleted an item which had a Custom widget area, that widget area will remain. 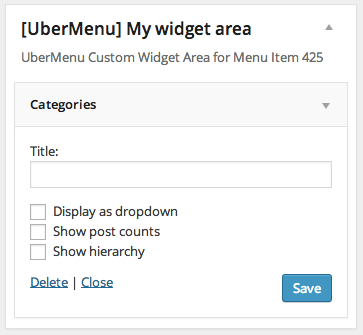 If you’d like to remove it, you can go to the UberMenu Control Panel > General Settings > Maintenance > Manage Widget Areas.